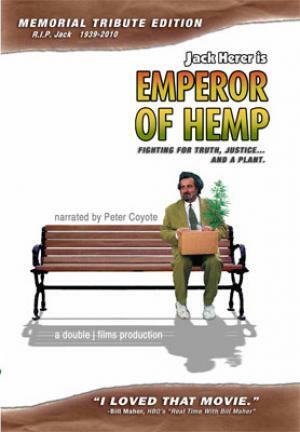 DVD Review: "Jack Herer is the Emperor of Hemp"
Jack was definitely ahead of his time. His ideas about Hemp saving the planet are even MORE relevant today. Let's keep his message alive. Use Hemp products! They are carbon neutral and truly a "green" way to live. Legal hemp will save the world! I have studied useful plants in a village technology context, and only bamboo and coconuts come anywhere near hemp for general all round usefulness. Allowing rural communities around the world to have back an important crop and industry will have a dramatic impact on their viability. People will be able to move back to rural regions with out fear for their financial security. Cities can be less congested and could grow at a more manageable pace. And ending prohibition is certainly going to have a huge impact on the well being and security of the world people. Prohibition has a massively corrupting influence on our governments and results in a brutal over policing of our private lives. And politicians corrupted by prohibition find themselves incapable of making appropriate decision when it comes to sound management of our communities. With starved rural communities, corrupt governments, drug funded terrorism and wars rampant around the world, I really don't think it's too much to claim that legal hemp would save the world. I think Jack was as much a prophet as he was an activist. Paul Pot: I agree with your comment above and want to add that I think your name is fantastic. Have you been to Cambodia? Have you seed the cannabis for sale in the markets? Brought back a huge slice of world history...Hell of a story. I met Jack Herer a few times in the 1990's. I believe the first time was at the capital steps in Olympia, WA where he signed my copy of "The Emperor Wears No Clothes." I also saw him at Bill Code's "Hempfest" in Oregon a year or so later. He was always full of energy and getting the word out on all things cannabis (hemp and marijuana). If there ever were a "loudspeaker preaching character" of hemp, it would hands-down be Jack Herer! Educate yourself and others. The Global Hemp web site has tons on info. Vote with your dollars and purchase hemp products. Request that your Congressman support Ron Paul and Barney Franks federal industrial hemp bill. THis one surely is funny! well, i assume that the movie will have a great release and will have good profits because I too is excited with the upcoming movie! When I read the “Emperor Wears No Clothes” back in 1995 for the first time I really thought that this was something new or at least a rediscovered valuable resource (Billion-Dollar Crop – 25,000 products). Being somewhat of a dreamer, my first thought after reading his book, I thought for sure my next adventure would be a Farmer of Hemp. I even started looking for farming land that may be secured before the good farm land got covered with warehouse and parking lots. It did take very long to understand that there was a Drug War going on and the more I looked into this idea it became apparent that I was looking at a real uphill challenge. Then I started looking at the internet for information and the more I looked the more I could see that this mess was being driven by the controllers of the US Government around the world! Then it came to me; this war is about HEMP and Marijuana was the perfect tool for the powers that be were going to hold on to this catch 22 to the bitter end! Once Marijuana is no longer in prohibition, HEMP will flourish and our country will start to heal! "GODS GREEN HERB": On the Sixth Day of Creation, God gave man "the Green Herb" to use as "meat" for all living things. When Noah first stepped off the Arc, in the first verse, God gives Noah "the Green Herb." There is no other plant, let alone an herb, that has all GREEN flowers, leaves, stems, branches, trunk, roots, and is also among the few and unique plants that have both male and female plants; and can go gay - hermaphrodite. King James version calls it the "Green Herb." Other versions change "green herb" to "green vegetation" but that is redundant as vegetation was previously created in earlier days. And "green" is very specific. It is the same in all languages over all time. Had a name such as ginsing or rishi been given, then nobody today would know for sure what the meaning was because language changes so much over thousands of years, whereas color remains the same. "Green" as in green grass or "green herb" is very specific and obviously is a unique metaphor. But that is only a small part of the greater conspiracy. "Linen" in the Bible is made from hemp, a result of the "green herb." Bible scholars insist Biblical linen is made from flax. But, virtually all Egyptian mummies test positive for cocaine and hashish. The Pharaohs were pot heads and they wore hemp "linen" clothing. Hemp grows in arid climates; flax does better in more temperate climates. So what? Why the conspiracy? Consider the Book of Daniel which contains the only two references to the Messiah/Messias and is the "Writing on the Wall." Daniel was a captured Jew sequestered in Babylon who did psychic interpretations for King Nebuchadnezzar. There are 12 chapters in the Book of Daniel and they are all "visions and dreams"; for example: "I was standing near the river Chebar when an angel appeared clothed in linen." First of all who cares what fabric someone is wearing and how can you possibly recognize its fiber when the person, or 'angel' is standing far away? Obviously, this is not a reference to a fabric but a metaphor for the Green Herb. Put another way, Daniel was cruising with THC in his body; maybe he smoked the green herb in a clay chillum (chillum is a standard smoking implement found in almost all excavated ancient civilizations) or maybe he ate it. Daniel got good and stoned and saw god, an "angel," the alien sent down by the "lords from above" on the "Rock of Ages"
The "Rock of Ages" is a metaphor for the Planet of the Gods which is returning from the "bottomless pit" of outer space, "for a season" to cause major Earth changes; CO2 is a smoke screen obscuring the real reason they can not talk about 'the serpent, dragon, the devil and Satan' which is in the sky now. In ancient Babylon, Daniel knew it as the 12th planet or Nibiru. Everyone should Google Planet X and follow the conspiracy. The powers-that-be most fear the truth getting out to "the meek and humble" to expand their consciousness with "God's green herb." That is why Biblical metaphors are so difficult to understand. You have to be stoned on God's Green Herb to read and understand the computer generated characters printed in a continuous line and given to Moses along with the Ten Commandments. The first five Books of the Bible are the Tora the 'lords from above' gave to the wandering tribe of Jews fleeing Egypt after the last time Nibiru caused havoc on Earth and resulted in the Biblical Seven Plagues. All you have to do is look on the back of your greenback. It is an IOU for your gold: IN GOD WE TRUST> The Planet of the Gods staring over its celestial marker, on Earth - the Great Pyramid - built to last "a thousand years"; or in the case of PX, 3,657 years average. The last time here it ended the Empire of Nibiru-Chadnezzar; they were the Mardukes from the Code of Hammurabi and the "Dukes" whose lineage is given in the Book of Genesis. And all you need to figure this out is God's Green Herb and an Internet connection. Download any Bible download such as Bible Pro and get multiple versions of the Bible with a search engine. Compare King James to the Catholic version for example. Then do your own search for all kinds of words besides green herb and linen. It is the Greatest Story Never Told making it the biggest conspiracy Ever!